We're continuing to send the DVD to countries all over the world; it has reached over 30 countries by now! After months of hard work the new challenge is launched, for all of you who like to travel and need to practice languages: www.tryandsay.com. Don't miss it! For now it is completely free. Use it to practice languages to help you travel safely and comfortably. Sign up and be surprised how much fun it is to practice with people from all over the world helping you! I've just uploaded the photo gallery of India. Soon, I'll upload the photos from the remaining countries: Nepal, Australia and the return home through Brazil and Argentina. I'll also upload some galleries from countries we visited without our bikes: South Africa, Lesotho, Thailand and New Zealand. These five years of getting to know different cultures and their different problems left us with a lesson for life. We have found a quintessential word which sums up what we humans need in order to change and deviate from the autodestructive course that we are following until today. One word, to which we still don´t attach great importance, a word which we forget easily: RESPECT. What can we do to respect respect? - Act like big brothers/sisters: we´re only another one of the species populating this planet, the only difference being our superior intellect. This privilege of being able to reason doesn´t give us more rights, but more responsabilities. A big brother does not use his capacity to take advantage of his smaller brothers, but he uses it to take care of them, protect them and allow them to develop healthily. Let´s do the same with our little brothers and sisters, the other species that, like us, populate this planet. We´re all one family, we live in the same house: planet Earth. Animals, rivers, trees, oceans, atmosphere; we don´t have the right to exploit them, to contaminate them, kill them nor cut them only to enhance our comfort. Let´s advance more slowly, if necessary, but in harmony with nature. - Save resources: use less energy (petrol, electricity), use less chemicals, use less water, less throw-away packaging. In one instant, we´re burning all of the energy that took millions of years to accumulate. Think about the serious consequences this is having on Earth, and therefore on us all. - Dreams vs. Earth: don´t listen to the people who say "nothing can be done", "it´s impossible to change everything", or "that´s just the way it is". The belief that "it´s not possible" kills every initiative. Many of those who have been successful began with the same resources that you and I have today, or much less. They put earplugs into their ears, didn´t listen to the badmouthing on TV and just went ahead and tried something. "And if I fail?" If you fail, you´ll have more experience than what you started out with, experience to use as a basis for the next time, and you will know more about what´s possible and what´s not. But beware - not all dreams are valid, only those that do not fail to respect other living species, our rivers, seas, and oceans... in short, our brothers and sisters that have to live with us for the generations to come. If every one of us contributes a small grain of sand, together we can build a mountain, a better society. Neither us, nor the policitians, nor the businessmen will change the world today. The change is gradual, but we have to begin with ourselves. We have to start to be conscient and do our part. Every time we do anything we have to stop and think; let´s not do things just because we´ve always done them in this way. We lifted off at 17:00 hs in New Zealand and landed at 13:00 hs the same day in Santiago de Chile. This was our first trip to the past. Another flight took us to Río de Janeiro, where the motorcycles would arrive some time later by sea. From there, we would be setting off for home. We're staying at Murilo's house, a good friend who prepares shakes from all kinds of fruit you can imagine: mango, cashew, cupuaçú, tamarind, siriguela, acerola, guava, coconut, maracuja, graviola, cocoa, cajá mango and the most delicious of them all: açaí. The company who is shipping the motorcycles from Australia (Cargo Online/AGS) has commited a small logistical error which is causing a delay of six weeks in the arrival of the motorcycles. They should already have arrived in Brazil, but instead, they are now in Corea. Being without the motorcycles for so long and arriving at home one month late bothered us a lot at first, but now we're seeing the positive side of it: we're using the time to catch up on our work while we're trying a new shake invented by Murilo. We're happy about being on our way home. Happy that we were able to complete the objective we set ourselves five years back: travel around the world on motorcycle, reach Australia and visit and hug my brother and his family, and transmit to as many people as possible the idea that dreams depend more on your decision than on time or money. As we advanced more and more on our voyage, we observed another fact about dreams. Many people don't notice that they already hold their dream in their hands. A house, a family, wonderful kids, work, a stable life. Many of them keep their eyes on something distant, thinking that going out into the world will make them happy, and they complain about their bad luck of not having neither the "time" nor the "money". If you are one of them, remember that you have something that most of those who roam the world (including us) don't have, and greatly desire. You don't have to be a conqueror of the world. You already hold a treasure in your hands. If you think that your heart is set on fulfilling your dream, make the decision and do it. Whatever your dream may be, whatever you choose, concentrate on what you want. Don't stand on one side of the street and fix your eyes on the other one, that is one of the surest ways to loose time and happy moments. Of course knowing what you want is the most difficult part. This knowledge is often overshadowed by fear and by thinking that many things are impossible. Maybe some of them are impossible. Maybe not. The only way to know is to try. You'll never regret it. Especially not if you succeed to fulfill your dream. Stay tuned. The story is only just beginning! At last we reached the goal we had dreamed about for so long, during these last five years on the road with our motorcycles. Here in Brisbane we reunited with my brother and gave him the hug he'd been promised so long ago. My mother and my sister were also here to receive us, which made the situation even more emotional. Having a goal has helped us keep going in many challenging situations, when everything seemed impossible. Even though we have passed many difficult moments, when we look back we know it was worth it. We will always keep the memories of all the special people that we met on the way and via this webpage. Thank you for always having been there, always supporting us. Now comes the last stretch back home. We will send the bikes to Brazil on a ship, and from there we will take some road to Buenos Aires, where we will close the circle. There's a lot of road still ahead. If you want to lend a hand and at the same time enjoy some material of excellent quality that we have produced throughout this voyage, we recommend you the DVD kit. You won't regret it. We will continue to upload fotos and to update the information on this site, and we hope to soon be able to answer all of you who write to us. We wish you all the best, and don't give up the fight for those dreams. A big hug! Despite the warnings we had been given, we decided to take our chances and enter Nepal on the planned route, via Nepalgunj. We were very eager to leave this hostile northern part of India. We had been told a million different "facts" about the recent flood in Uttar Pradesh, most of them indicating that it was not possible to pass through. But we didn't want to loose another day making a detour of hundreds of kilometers, so we hit the road, and... hit the flood. But it was passable on the bikes, and we reached Nepalgunj just a few minutes before the customs offices closed. The Nepalis happened to be far more relaxed concerning bureaucracy than the Indians. Goa is heaven on earth. Goa is blue sky, endless sand beaches, coconut trees, friendly people, staying with families in small shacks on the beach, enjoying local religious festivals, lying back on the sand together with the cows, relaxing and enjoying life… Goa is so many things, except for one – Goa is NOT India. Goa is one of India’s provinces, but it seems to be a different country. 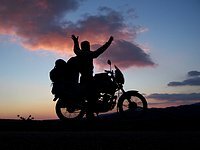 As a motorcyclist traveling a country, you see many things other tourists do not see. Apart from the tourist places like Jaipur with its temples, bazaars and guided rickshaw tours, Agra with the mesmerizing Taj Mahal and heavenly Goa, you see the hundreds of kilometers of roads, villages and cities that lie between. There comes a moment when the lack of hygiene becomes too much and impossible to avoid. Two times already we have come down with fever and diarrhea. Our days are dominated by reaching a somewhat large city to find a safe and acceptable place to sleep and eat. Irrespective of this, India is filled with a unique spirit. It is a touching experience to see the cows lying in the middle of the road without being disturbed by the chaotic traffic, observe the women with their colorful apparel and gold bracelets and listen to the people speak English with that distinctive accent. Incredible India – incredibly beautiful in some places, incredibly poor and ghastly in others. Although you’ve heard the stories, seen the pictures and watched the documentaries on TV, you won’t believe your eyes when you see the things that happen here every day, every second, every time you move a few meters. There is no way to describe it, it’s simply – incredible. In Iran, we met the most hospitable and friendly people we have encountered on the road so far. We were stuck in the middle of Iran with 12€, with no possibility of accessing our money due to economic blockades we had been unaware of. Thanks to the help of many Iranians, we did not only survive 1000km on the road, but reached the house of our friends in Tehran with more gasoline in our tanks, more money in our pockets and more food in our bellies than we had started out with. Contrary to what people usually think, we felt completely safe in this civilized country, although they do have some customs that might shock a westerner coming for a visit. For example, all women in Iran are required by law to cover their hair and all of their skin except for their hands and face. At 45 degrees in the shade, Elke was melting defenselessly. Putting aside the cultural differences, it is fascinating to discover the cities and the bazaars of Iran. The architecture is astonishing, and the rich Persian culture makes visiting this country and getting to know its real face worth your while. "Welcome home, Elke & Gustavo" said the sign on the door. Fatih and Didem, the president of the motorcycle club "Turkbikers" and his wife, had never seen us before in their lives. We had exchanged a few emails, and now here we were, in their home, which would be our home as well for one month. We had planned one week or so in Istanbul, but we were unable to leave our new-found friends. Together we watched the European Championships, and in the game Turkey-Germany Fatih even cheered for Germany and painted a black-red-gold flag on his cheeks to prove his friendship to us. We were very touched. Fatih and Didem are also dreaming about a tour around the world on motorcycle, and we promised to see each other again someday somewhere in this world. Asia was at our doorstep, and we were very excited to enter. Crossing the Bosphorus for the first time and passing the sign "Welcome to Asia" made our hearts beat faster. We had made it, all the way to Asia, on our own two motorcycles!! We've been working on the site a lot, even if we haven't been posting news items. We really appreciate the effort of all the translators who make it possible for the site to be available in 9 languages already! From now on we will be posting here more frequently, telling you all about what happens on the road. We apologise to all of you who haven't yet received an answer to your email. We will catch up with our mail as soon as we can. We never cease to be amazed. After travelling Poland from north to south, we were again left without words. After four years of travelling, the kindness of the people continues to surprise us. There are no words which could express our gratitude for the positive energy that everybody transmits us throughout our path, in every house in which we stay and through the website and emails. Thanks to all of you for that, it is what gives us the strength to continue, to maintain this site and to continue dreaming about new encounters. Our dream is to meet up with everybody, with all of you. Poland is a country that profoundly exhibited us the hospitality of the people. Thank you for these unforgettable memories. Thank you, all of our friends, all of you that send us words of strength. We carry all of you along with us. On our motorcycles there is always enough space so that we can live this dream together. Many people tell us we chose the wrong time of year to visit Poland, that we should have come in summer in order not to freeze. We totally agree when the pain in the fingers and toes becomes unbearable. But we will never regret experiencing what the inhabitants of this region go through six months or more of the year: living in a giant refrigerator. Seeing the landscape covered with snow at sunrise with the soft undulations of the fresh snow from last night is priceless. The experience of digging out the motorcycles from under the snow to hit the road for another small stretch is something we couldn't have missed. Skating along the ice with tightened brakes is the most "exotic" thing that has happened to us. No doubt this is an experience that has "frozen" itself into our memory. This is what every Pole asks us three minutes after having met us. Every time we get to know somebody we know inevitably they will invite us into their home for a tee (herbata) or a coffee (kawa). The people are charming, and the landscapes in the north of the country, where we are now, is enchanting with its hundreds of lakes and forests emerging after every turn of the road. Winter is coming, and we begin to feel it here in the north. But the warmth of the Poles is distracting us, which is dangerous because the snow will surprise us on our route towards the south. For over one month we were living in the back yard of a mechanics garage of a small town while we were servicing the engine of the truck to prepare it for the things to come. We are happy with our decision to add this new vehicle to the trip. It allows us to stay longer at each place to get to know it more profoundly. Also it gives us a place to work. We have already been able to finish the new edition of the DVD, which you can find here. Keep reaching out for your dreams and challenges. Never get tired of persisting. This week we are on Rügen, an island in the north of Germany, shooting with the German television channel ZDF. They're following us day and night, on the road and camping. In mid-august the episodes "starring" us will be shown on television and will also be available in internet. Our film team is great and loads of fun, so don't worry, we are having a great time working with them. Shortly we will upload the photos and videos of these crazy days so you can share the fun with us! This is the name of the newest family member. He is the great dinosaur that will help us work during this phase of the voyage in Europe. Dreams need to be nourished and protected so they can grow, and "Womo", our new truck, will be the cave where our dreams can grow and prosper. With "Womo" we can work while simultaneously continuing on the road, advancing towards the goal awaiting us: Australia. "La Garota" will continue on the asphalt, in order not to break the promise of a trip once around the world on motorcycle. Elke will be the official driver of the "giant" that will be our base for expedicions and adventures together on both motorcycles. The voyage around the world on motorcycle continues, every day with more power and energy, moving forward. Nothing will stop us... Here we come! Technical data of Womosaurus: Born in 1980, 550.000 kilometers travelled. How we bought him? We're up to our eyebrows in dept. This will be the name of the website from now on. This phrase summarizes everything that can be found here: "motos" (motorcycles), dreams and "remoto" (remote) places. The internet address is: www.re-moto.com, although the old address will continue to work as well. For those of you not fluent in Argentinian slang: the prefix "re" is used in Argentina to emphasize the following word, as if it were a superlative. This just so you can appreciate the pun. We'll meet you here soon, as always! A big hug from Linde, a small village 50 km north of Berlin. We are finishing the last details to hit the road again in one week approximately. The plan is to visit the north of Germany and then cross over to Poland, where we will follow the lost trails of Gustavo's family. On our site we added pictures from France and Andorra, plus a section where you can see all of the comments of photos. Finally, we would like to share a great joy in our lives with all of you: we got married! The news from Oct/2005 came true - incredible as it seems. Now the adventure will go on as a family. Thank you for travelling with us. We always receive your greetings and good wishes hoping that our paths will eventually cross. Some day, some place. We are in Berlin, where we are working hard on continuing the journey. We had some crazy ideas and are working intensively on them. It is a time of growth, a time where the dreams become even larger, and one has to concentrate hard in order for them to become reality. The project is growing, it's still TOP SECRET, but as soon as we see that it is taking definite shape, we will let you know. All of this is only possible thanks to the encouragement that you send us daily. Thanks to all of you for the beautiful emails and comments in the guestbook. We have added the possibility to comment on the pictures, as well as to evaluate them with points. We are sorry if we have not been able to answer your email yet. We have not forgotten you, it's just that we are a little overloaded at the moment. Soon we will catch up. A big hug!! "People from the north are cold and uncommunicative". That’s the myth that can be heard in the countries of the south. We shattered this myth completely travelling through the “cold” countries. In France, Belgium, Luxemburg, The Netherlands, Germany as well as in Denmark we have constantly met the most friendly, kind, talkative and welcoming people you can imagine. We love these countries and their people! This time we had to leave behind our love for travel without prior planning. Due to organisational reasons we have to arrive in Berlin on a certain date. To achieve this without having to camp outside in the cold winter night, we coordinated overnight stays with 16 people from Paris to Berlin. I thought this would be impossible. But now I have a German co-pilot, there is no lack of organisation, and as of today, we have not gotten delayed a single day. It is a very nice (and at the same time strenuous) experience to have dinner with a different family every night. We are learning so many things... thanks to all of you for so much hospitality! Canals, windmills, flowers... and a broken letter-box. Ok, there's not too many flowers because the season is already over, but water, canals and windmills are everywhere. Also hospitable people, like the girl who accomodated us in Groningen. And what's more, very trusting, since almost not knowing us she gave us the key to her appartment this morning when she went to work. "Put it in the letter-box when you leave", she said. This we did, when we thought we had everything packed onto the motorcycles. But, "Hey! The papers! ", I remembered just one second too late. After trying unsuccessfully with a wire, we resorted to the lever bar to open tyres. We tried to open the door just a little bit. But, "clank! ", we broke the lock. "Susy will definitely kill us! Now what do we do?!?" We tried with every type of glue... nothing. We were hiding the bars and pliers every time a person passed. Finally we drove back into town and with some difficulty obtained a lock that was exactly equal to hers. Once that was in place, and we were relieved, we continued our way towards Elke's native land... with a broken lock in our pocket. Maintaining the water outside, and inside as well. Has anybody seen our host? In some cities we stay with people who offer us accomodation through the Internet. It's a brilliant system, but sometimes strange things do happen. Like tonight, when we waited for two hours on the street because our host had forgotten about us! Finally other charitable people from the house saw us on the street and put us up in their flat... thank you Nesrine and Ronoy! In two days we will leave Belgium, which has impressed us greatly with the beauty of its cities. We strongly recommend visiting Brugge and Gent, pintoresque cities with canals and little ships everywhere, in the style of Amsterdam and Venice. "Make sure you get up early and leave, it's hunting day", the farmer who saw us put up our tent in a small forest in France warned us. Searching for a place to put up our tent when the sun begins to fall is our daily task. We then take smaller and smaller roads until we find a nice place on a hill or tucked away in the forest. It is usually difficult to find a place, since there are houses and fields everywhere. Today we camp ten meters away from a lake with ducks. So we'd better run tomorrow morning, before they start to shoot at us. This is how far we drove today on our mighty machine which Elke has lovingly baptized "Monster". We crossed the boarders between Germany, Luxemburg, Belgium and France in only a few hours; with a little trick of course... it's all just next to each other! We thank our friend Serge for giving us accomodation and a lot of support in Luxemburg. But only for a few days... our friend Vicente lent us a beautiful Yamaha XJ900 in Paris, with which we are doing a spin around France, Belgium and Luxemburg. We enjoy the power and the speed, but we also miss the tranquility of our "little ones", that allow us to enjoy more fully the countryside around. But let's forget about that for the moment... let's raaaaaace!! We have completed the second tour around Spain, Portugal and Andorra. 15.000 km that left us verwhelmed with kindness and hospitality of the people in every city, and dazzled by the beauty of it all as the kilometers rolled along under our wheels. We have now finally abandoned the peninsula. With one eye crying, as we are leaving behind many beloved friends, but also one eye laughing, full of enthusiasm for the new routes and cultures that await us one the road. We are now in Paris, where we are staying at our good friend Jeremy's house. Finally we have the possibility to work with a roof over our heads and access to the Internet. We hope to finish the homepage in a few days. There are hundreds of new photos to sort through and stories to write down. Soon everything will be online, so look out for that! The motorcycle clubs in Portugal are 'de mais'! We met wonderful people in Portugal. We stayed for one night in the Motorcycle Club Faro, in the south. They have rooms especially prepared for travelling motorcyclists that want to recharge their batteries, and they display a very special warmth in receiving you that you end up wanting to stay there. A very special thank you to José Amaro, the president of the motorcycle club. We also got to know the people of the Moto Club Lisboa, who even though we arrived very late showed us their headquarters and offered us splendid accomodation. Last weekend we were at the motorcycle meeting of the Moto Clube Leiria, and continued to have a great time thanks to the friendlyness of the Portuguese and the support of MC Leiria. We rode all the way to Jerez to assist in the Gran Prix de Motos, and we were invited by the organization to exhibit the voyage inside on the racing grounds. We placed the motorcycles and the sign just a few meters away from the race track, so we could almost say hi to Rossi, Capirossi and Pedrosa every time they zoomed past. We had a good time at this great festival, and Sunday night we fled to a tranquil beach to rest. More than 50.000 motorcycles come to Jerez every year to be at the Gran Prix. It´s more than a race, it´s a motorcycle celebration. This was how we got to know Gianni, while we were having our cheese and ham sandwich next to the sea in Denia. La Garota was parked a few meters away from us, and Gianni, who passed by, stopped to look at her. Right there we made friends, and Gianni (Giovanni Celli) was the one who ended up sponsoring the motorcycle we needed in order for Elke to be able to join this adventure. Gianni told us that he is a pilot in classical car races. This is why we went to Mallorca, to see him participate in the Classical Rallye of Mallorca. We took a ferry from Barcelona and spent a few days on the island. Somebody very very special joins the voyage! Now you know the reason why I stayed in Spain for so long. Her name is Elke, and she is the girl with whom I want to share my days. Because of the things that destiny does, our paths crossed, we got to know each other, and we fell in love. We thought that our paths were very different and that each should continue his path. She is German and is studying a PhD in engineering in Barcelona. Today, a day of surprises, a daythat changes lives, we have two motorcycles waiting downstairs at the door. The old "Garota" and the young and sparklingly brand-new "Milton". Starting as of today, a new experience begins for both of us. We will continue together, shoulder to shoulder, to Australia, and to all of the places that this incredible life will want to show us. Finally the motorcycle has left the port (special thanks to Yamaha Spain and to the motor-racing team TCR) and I have already covered some thousands of kilometers in Spain. 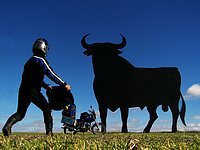 From Barcelona to Alicante along the coast of the Mediterranean, later penetrating Castilla-La Mancha to Cáceres in Extremadura, and later going up to Salamanca and Valladolid, where I took part in the "Pingüinos", the famous winter motorcycle meeting. I posted many pictures in the Spain section. The travel through Spain will continue, I hope our paths will cross each other soon. When I came out of the airport of Madrid and began to roam the streets, enter the restaurants and talk to the people, for a moment the thought crossed my mind: "the voyage is in danger!!"... the streets were swarming with women so beautiful that the eyes can´t cope; every 20 meters a bar tempts you with an incredible variety of food and wines, the eye can´t detect defects in the architecture and tidiness of the city; the air is pleasant, impassioned and cosmopolitan because of the people in the streets. Right now I am in Barcelona, and in a few days I will pick up the motorcycle at the port, where it has arrived from Mexico on boat. My first intention is to hit the road towards the south. As soon as I have more news I will let you know. I leave you a story of some experiences in Madrid, Zaragoza and Barcelona. Finally... she left! This is the first time in 20 months that she will be more than 10 meters away from me, but it will be worth it, because the reunion in Barcelona will be grand. The ship that is transporting her over the Atlantic Ocean will land there. Special thanks to Sidney Lewis (FAST), Federico Martínez (CrazyBoxer) and Víctor García, who made this shipment possible. I will stay in Mexico a few weeks more, waiting for the "La Garota" to arrive in the Old World before flying there myself to take up again those roads that provoke so many expectations in me. Which friends will I find? Which landscapes, adventures and difficulties are waiting for me? There is only one way to find out: continue ahead. 24 hs of Enduro and crazyness! Every July a great motorcycle exposition is held at the World Trade Center of Mexico City, and there I spent four excellent days getting to know people out of this world. Thanks to all who came to the stand and collaborated bying postcards and CDs! The expercience was repeated at the Expo Bici, where wonderful people appeared from everywhere to tell me about their own dreams or travel experiences. Just one negative experience: somebody stole my digital camera. Where there are motorcyclists, there is fun, that´s the principal law. And even more so when hundreds of them unite, from all parts of the country, with the only objective being having a good time and share the passion of two wheels. So I went with my good friend Lev and his brilliant sister rolled towards Querétaro, the point of reunion 210 km from the capital. Here are some pictures of the event and the routes. The motorcycle was already needing a bit of maintenance: some noises in the starting mechanism, the gas tank dented and rusted, the exhaust damaged, broken spokes, the clutch worn-out, the tyres worn out, the battery exhausted and other little things. Yamaha Motor of Mexico took care of all of this and much more, leaving the motorcycle as good as new to continue rolling. The trip from the peninsula of Yucatan to the capital of Mexico was very unique, most of all because of the special people I met in each city. The was no city where I did not make great friends, whom I will always remember. Click here to see the story and the pictures of the trip. Thanks to all mexican friends who are contacting me from all over the country!! Thanks for the mails that give me the strength to continue and for all the support!! Thanks to all of the friends I have already made in Quintana Roo and who are helping me a lot in my first kilometers here. Thanks Pilar and Paty (Chetumal)! Thanks Rafael< (Cancún)!Friends!! We´ll see each other on the road!! For the people of Belize, it is normal to be bilingual, and it is very common to speak three or four, and there are some that speak up to seven!! The official language is English and it is the language spoken in the schools, but because of family heritage the mayority also speaks Spanish, and many speak Criollo amongst themselves, which is a strange kind of English. Because of the large indigenous population, Maya and Quiché are also spoken. Along the coast, Garífuna is very widespread, which is a mixture of an african tongue with that of the first caribbean settlers (Arawaka). Another language spoken is Mestizo, which is a mixture of Spanish with something else. Visa for one day Oops! At the border of Belize I realized that Argentinians need a visa to enter, and I hadn´t budgeted for the money to buy it, but after insisting a bit and explaining them my voyage they let me enter the country, but only for a day! In the middle of a storm I arrived at a small village on a heavenly beach, and super super tranquil. Here I am looking out of the window at the beach while I am writing. Tomorrow at noon I already have to be in Mexico. I just visited the National Park of Tikal, an incredible Maya city in the middle of the jungle! The Spanish found it mysteriously abandoned when they arrived in America. It has many temples in the form of pyramides, dedicated to different monarchs, and altars where human sacrifices where held. See pictures. To get to the Lachuá Lagoon, I had to cross 120 km of sand and stone trails that did make me a bit nervous... Poor little motorcycle, it seemed as if it would fall apart on the parts of the road that were full of stones. Coming back I preferred to travel at night to see the ground better with the light of the motorcycle. But I got a bit carried away sliding about on the little stones at high speed and my leg got stuck between the suitcase and a mound, leaving me with a good bruise... See pictures. Red Alert! They're burning everything! It is sad to see that in certain parts of the country the destruction of the forests is advancing rapidly, and they use the burning strategy to clean the fields, which often "by mistake" sets fire to the woods. In Cobán, there are days where you can not see the sun because of the smoke coming from the fires. The government does little to encourage a better management of the soil by the farmers, and thereby avoid that it wears out and impoverishes. And the ecological culture is fairly poor. I saw with my own eyes how people had the nerve to enter and exit a national park with shotguns and pistols, to amuse themselves a bit with the last specimen of jaguars, pumas and tapirs that are left in the region. The rocky structure of the region is soft, since many rivers erode it and form long subterranean caves, which with time fill with stalagtites and stalagmites. I visited the ones of La Candelaria and of Rey Marcos. The first one is very large, with parts that have a height of up to 60m, and can be visited by kayak along many of its 30 km of length. See pictures. With a candle in one hand and swimming with the other, one has to cross a cave which threads its way through the mountains of Semuc Champey. In total, it is 11 km long and is penetrated by a current of water that flows into the river Cahabón. One can see stalagtites and stalagmites of various types, and you have to be skilled to dodge the bats at the entrance, swim with one hand, climb waterfalls with the help of ropes, descend through water-filled holes, dive underwater, without the candle going out!! I was able to get away from the magnetism of the Atitlán Lake and took the road towards the center of Guatemala. First, I passed some dry, mountainous, interesting landscapes which suddenly changed to intense vegetation with increasing altitude. On a road of loose stones I slipped with the motorcycle and twisted my ankle, which had gotten stuck underneath (I wasn´t able to jump off in time), but it wasn´t serious. And what was the prize in getting here? A paradise on earth: natural steps of swimming pools that form above a river that penetrates a 300m long cave, the water a crystal-clear torquise, with small fish milling around you, and with the perfect temperature to swim and go from swimming pool to swimming pool along the cascades, all of this in the middle of the jungle... This place is a dream. See pictures. I got to know two couples of brilliant people: the first one are two Germans with their little daughter who are travelling all around the world since 2001 in a truck from the 60s, and the other is an Englishman and a French with their little son who have been travelling the world in a double-decker bus (also from the 60´s) for 8 years, doing circus shows!! (www.thesprockets.com). People out of this world. This place is gorgeous. There is a lake of crystal-clear waters, surrounded by mountains and volcanoes. Around the lake there are various villages and cities, each with a different magic, but all of them with a characteristic in common: the indigenous culture is extremely alive. The inhabitants, especially the women, use typical clothes with fine embroidery of birds, flowers or Maya patterns. They speak their own language (Tz'utujil and Kaqchickel) and, sometimes with difficulty, Spanish. In Santiago Atitlán, the largest village of the lake, this spirit is lived even more strongly. The place also witnessed the massacres during the 30 years of Civil War that the country suffered (1966 to 1998). See pictures. I arrive at the of Guatemala, and spend a night there. The next day get to know La Antigua Guatemala, an incredible colonial city, very well conserved and Cultural Heritage of Humanity. Any photo you take of this city is a postcard. From there I go towards the Lake of Atitlán. All of the south of Guatemala is very mountainous, and to get to the lake the road ascents significantly, arriving at parts where the clouds cross the road and it gets pretty cold. It's a lovely road to ride along on a motorcycle, with many curves in the middle of lovely landscapes. See pictures. In San Salvador I met my friend Daniel Breneman. I hadn't seen him for 8 years!! I drove through the country a bit and found very undulent landscapes, quite dry because of the season (in the Carribean and in Central America they call summer the dry season and winter the rainy season), and greener and fresher parts at higher altitude, where one can see a lot of cultivation of coffee. Everywhere you go you see volcanoes on the side of the road. Something that catches the eye in El Salvador is the eagerness of the people to emigrate, especially to the USA. Most of the people have some brother, husband or family member working in the USA, sending money. They have 6 million inhabitants and 2 million Salvadorans are in the USA!! Another fact that impressed me was the tremendous history of the war that this country suffered for so many years. Horryfying stories of massacres and assassinations for more than 10 years. I had been told that the borders of the region were complicated and corrupt, but they turned out to be very pleasant, with the most friendly employees. I like the people of these countries a lot. The northern half of Nicaragua is very dry. In the photos you can see the type of landscape that predominates this region. On the side of the Carribean Sea, there is more rain and the vegetation increases. Upon entering Honduras, the landscape begins to undulate more. A lot of poverty can be seen in this strip in the south of the country, but the people are extremely nice, simple and pleasant. I passed through Granada, a preserved colonial city on the shores of Lake Nicaragua. From there I went going to Managua, a very unusual capital, reconstructed anew after the last earthquake. It is a pleasant city, with wide streets and low buildings. The most interesting thing about it is that it doesn't have a center, but everything is spread all over the city. I went to a beach on the Pacific, San Juan del Sur, to spend Easter, but I expect the atmosphere to be a bit demanding because of all of the alcohol that will be flowing. The beach isn't very lovely (see photos), but I know lovely people. I entered Nicaragua!!! After the bureaucracy at the border and the customs, I went to the port at the Lake of Nicaragua, where I took a little boat to the Island of Ometepe. Incredible!! The island is formed by two conic volcanoes emerging from the lake. I will spend a few days exploring the island and then I will head towards the center and the north of the country.